Washing compound. Concentrated Potash one pound Sal Soda one pound, Borax half pound, Rosin fourth pound. Spts Ammonia two ounces - Grease the pounds - Put the Potash & soda into 3 gals of water till dissolved, Then add the grease & boil from 1 to 6 hours. Keep about the same quantity of water in the kettle as at first. After it becomes soap add the borax & rosin (the rosin should be separately melted in a little hot water. Just before taking it from the fire put in the Ammonia. 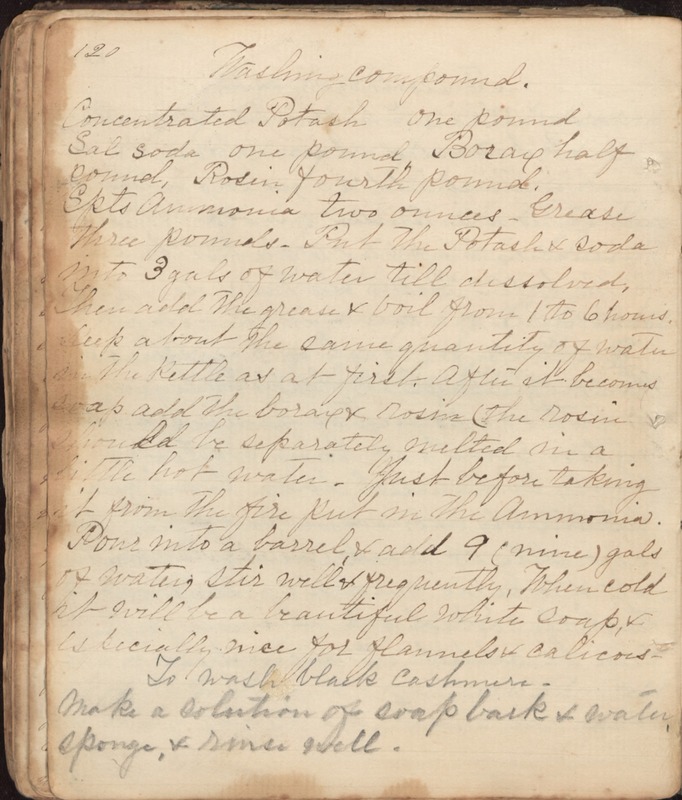 Pour into a barrel, & add 9 (nine) gals of water, stir well & frequently, When cold it will be a beautiful white soap, & especially nice for flannels & calicos - To wash black cashmere - Make a solution of soap bark & water, sponge, & rinse well.